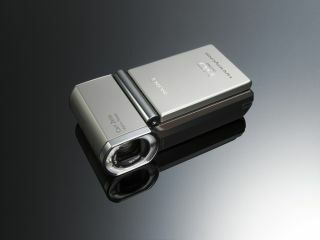 Sony's latest high-definition camcorder is one of those rare products to enjoy a simultaneous worldwide release, something that may be connected to the company's claim that it's the world's smallest full HD camcorder. The Handycam HDR-TG3E, as it's to be known in Europe, records in the AVCHD format to memory sticks, and goes on sale in May with a street price of around £500. It has some serious hype to live up to. A resolution of 1920 x 1080i is impressive, as are the 32 x 63 x 119mm dimensions and 300g weight but, problem is, the Sanyo Xacti we showed you last summer has the same spec, yet is 32g lighter. Of course, marketing suits play all sorts of tricks with caveats and asterisks, but this kind of thing does make us wonder if we're being led a merry dance. Anyway, the TG3E clearly has plenty to offer, so let's not get into Sony's bun fight about size. The upright-style grip always makes for a camcorder that feels smaller in the hand, while the flip-out 2.7-inch LCD is touch sensitive like recent Sony digital cameras. Still shots are possible at 4 megapixels in photo mode, or 2.3 megapixels when shooting video. In keeping with the newest Cyber-shots, there's face-detection software that pays special attention to every mug in the frame, and HDMI output for connecting to a high-def television. The welter of other features Sony has crammed in are best left to an in-depth review, but we're pleased to note that a 4GB Memory Stick Pro Duo comes as part of the package. The only thing we're wondering is, why does the Japanese model include an 8GB stick? No fair, Sony.